Crude oil prices have risen by nearly half over the last year, driven by OPEC-led production cuts and strong international demand. Yet in the next few months, it’s the confluence of several emerging geopolitical crises that may drive prices even higher. In the aftermath of the White House’s decision to abandon the Iran nuclear deal, market analysts are carefully watching to determine the full impact that renewed sanctions on Tehran will have on international crude oil supplies. In May, Iran’s oil exports reached approximately 2.7 million barrels per day, the highest since Tehran signed the nuclear agreement in 2015. While the full impact of any U.S. sanctions will likely not be felt for several months, many oil sector experts already assess that, at a minimum, Iran’s exports will fall by several hundred thousand barrels per day by later this year. 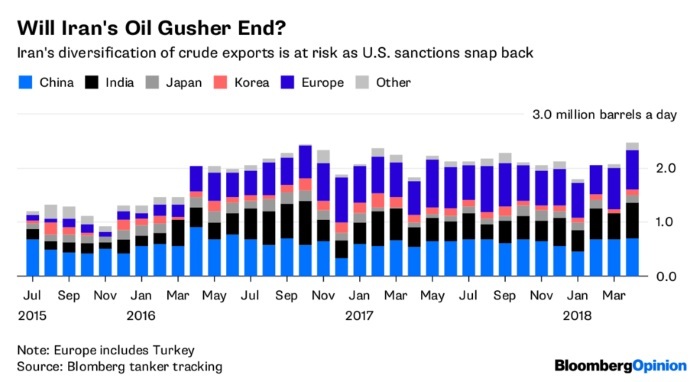 That’s a potentially significant cut to already tight worldwide energy supplies — and keep in mind that in 2012, when sanctions were last imposed on Iran, exports fell by about one million barrels per day. But that’s only one aspect of the Iran oil story — we also need to consider Iran’s likely response to the new sanctions. In my view — I’m currently on a government-funded fellowship and these opinions are solely mine — Tehran is unlikely to sit idly by in the coming months while its exports are restricted and other countries, such as Saudi Arabia, absorb greater market share. In fact, Iran’s track record strongly suggests that it will not be shy about retaliating when it perceives that its interests are threatened. In 2012, Iran was blamed for a significant cyberattack against Saudi Aramco — an attack that was widely believed to be in retaliation for the Stuxnet virus launched by the West against Iran’s nuclear industry in 2010. The alleged Iranian attack erased data on three-quarters of Aramco’s corporate PCs, and cost it tens of millions of dollars. It’s a safe assumption that in the subsequent six years, Iran has significantly upped its cyber game, and is now capable of launching crippling operations against a range of targets. Indeed, within the past few weeks, the FBI has warned U.S. businesses that Iranian cyber-actors may target U.S. interests in response to Washington’s abandoning the nuclear accord. Key U.S. allies, including Saudi Arabia, will undoubtedly also be in Iran’s cyber crosshairs as economic pressure builds. Tehran could also choose to signal its displeasure over new sanctions by increasing its back-channel military support to the Houthi rebels in Yemen. In particular, Tehran may decide to covertly enhance the Houthis’ ability to penetrate Saudi air defenses with missiles, enabling the group to more effectively target both population centers and critical oil infrastructure. In recent weeks, the Houthis have significantly increased the number of attempted missile strikes against Saudi Arabia, and in one high profile incident, reportedly used a drone to target a Saudi energy facility along the Saudi-Yemen border. A successful Houthi missile strike on a large oil facility in Saudi Arabia or the United Arab Emirates would send shockwaves through the international oil market. Other Iranian energy-related mischief could include proxy attacks in the Red Sea, as well as stepped-up pressure and harassment by Iran’s navy of cargo ships transiting the Persian Gulf. Of course, any Iranian attempt to respond to biting sanctions will be done in a fashion that’s plausibly deniable, so as to avoid provoking a direct military reaction, but that also signals Iran’s determination to protect its economic interests. Iran’s not the only wildcard for oil markets: Venezuela’s deepening political and economic crisis is, not surprisingly, another major source of anxiety. The country’s foreign oil sales have fallen by 40 percent since last year, with the latest reports indicating that they have declined to about 1.1 million barrels per day (down from 3 million only a few years ago). This is obviously devastating to an economy in which oil accounts for about 95 percent of total export earnings. The toxic combination of the Venezuelan government’s decades of underinvestment in energy infrastructure, the exodus of top talent from the state-owned oil company, the deteriorating political situation, and the potential for a new round of U.S. sanctions in the aftermath of last month’s flawed presidential election suggests that no solution to this crisis is in sight. It’s hardly surprising, then, that the oil industry is scrutinizing events in Iran and Venezuela, but are there other potential geopolitical threats that also might spook the market in the coming months? The answer is yes. In Libya, for example, the country’s main political rivals agreed recently to attempt to move beyond a stalled 2015 peace agreement and hold parliamentary and presidential elections in December. These elections, if successful, could be a major step forward in ending the turmoil that has plagued the country since Muammar Qaddafi’s ouster in 2011. At the same time, there are worrisome signs that the Islamic State is trying desperately to reconstitute itself in Libya following its defeat in Sirte on the central coast and in eastern Libya in late 2016. In May, militants launched a high-profile attack against the country’s electoral commission in Tripoli, killing more than a dozen people. And in February, terrorist fighters reportedly tried to attack the large Dhara oilfield using an explosive-laden vehicle. Islamic State leaders have long coveted a foothold in Libya, with its close proximity to Europe and vast oil resources, so we should anticipate stepped up terrorist operations there in the not-too-distant future. Last, there are a few other near-term developments that merit close scrutiny for their potential impact on the global oil market — including the possibility of a broader clash between Israel and Iran in (and perhaps outside of) Syria; Nigeria’s continuing challenges with oil leaks and violence in parts of the Niger River Delta; Brazil’s deepening political turmoil; and the future of Mexico’s energy-reform agenda following this July’s presidential election. Therefore, even if we receive more positive news in the coming days about falling oil prices, increased U.S. energy production and greater willingness of Saudi Arabia and Russia to pump up their oil exports, the rollercoaster ride experienced recently in the global oil market is likely to continue for some time. It will be shaped, as always, by fundamental supply and demand issues — but also by a geopolitical environment that is as fluid and unpredictable as at any point in recent memory.